Embossed Leather Journals, Diaries and File Covers with Handmade Paper. Available in multiple patterns which are embossed into a genuine leather cover. Pen out your thoughts, sketch or keep notes in these exquisitely crafted pieces of art. Catalog Available – Contact us for our Catalog. 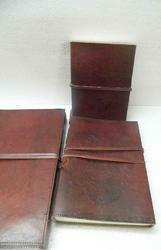 We are highly acclaimed in this industry for providing an optimum quality range of Leather Journal. We take pleasure to introduce ourselves as renowned manufacturer, exporter and supplier of Leather Journals. We have gained a huge appreciation in the market by offering an excellent array of Handmade Leather Journals. Handmade Leather Journals in large size with custom logo embossing we also logo emboss our leather journals as per your custom logos. Our leather embossed journals can also be embossed with your patterns. The Journal is hand stitched and comes with handmade paper and strap closure. A traditional handcrafted Indian leather journal with 100% recycled paper. Front cover is embellished with metal lock to close the journal. 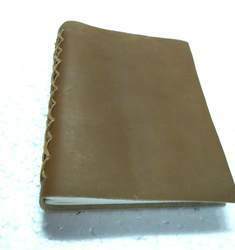 Backed by huge industry experience and market understanding, we are involved in offering a wide array of Leather Handmade Journal to our valued patrons.